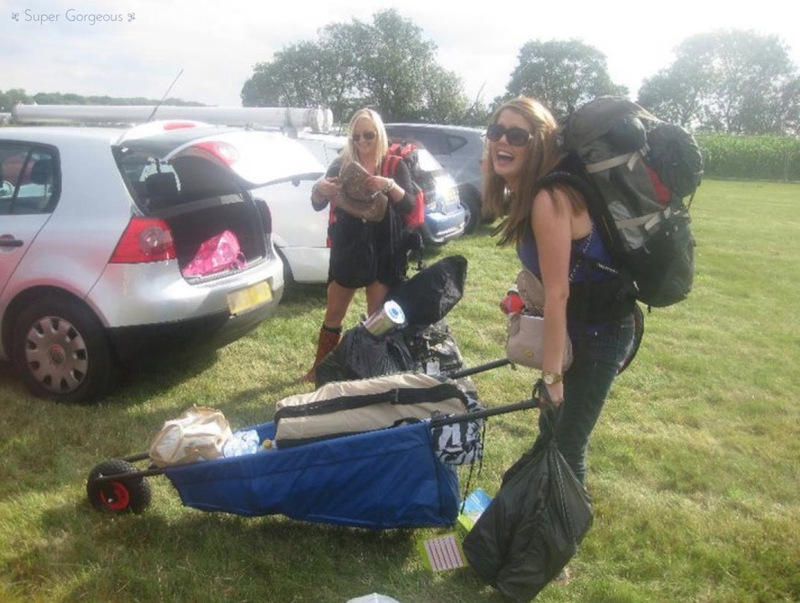 As I prepare my stuff ready for camping at V Festival this weekend, I thought it may be useful for me to write a post for any V Festival virgins wondering what the hell to bring! Last year was my first, and I loved it! The only thing I definitely did not enjoy was having to carry all the stuff we'd brought from the car to the campsite, which is about a 10 minute walk even when you don't have to carry ten tonnes of stuff with you. Don't bring stuff just for the sake of it, trust me! If you have an old buggy, shopping trolley or wheelbarrow that you could bring with you, bring it! Last year they were renting out wheelbarrow type things for about £10 if I remember rightly but they were really hard to maneuver and didn't make things that easy! Luckily we spotted one of the girls with us' brother with all his friends so they did the hard work for us. I am absolutely dreading it this year *shudder*. Right, first things first - camping equipment. One would hope you'd remember that if you were camping you'd have a tent. Make sure you have a mallet, or you'll have to sweet talk fellow campers into loaning you one of theirs... once their tent is up. Looooonnng, but the bonus is, if you're girls and they're boys, they might do it for you! Then you'll need a sleeping bag, pillow, torch, and non essentials but nice to have is a folding chair for next to your tent, picnic blanket, and if you want a bit more comfort... I don't know what it's called, but it's like a fat yoga mat which you lay your sleeping bag on to. It's really light so not too bad to have to bring, although it does take up a bit of valuable wheelbarrow space so you need to decide if that matters to you or not. It does to me - if I don''t sleep, I am miserable - and for that reason too, let me say: earplugs. If you're in red camping I believe the partying goes on until late late late... yellow camping is more chilled, but that doesn't mean people don't have their radios on, or aren't sitting out drinking by their tents so earplugs are a must. If you want to sleep past daylight breaking, bring an eyemask too. While we're on the subject of sleep - it is absolutely freezing at night. Last year (bearing in mind the weather was a lot better this time last year) I slept in leggings, jogging bottoms, ski socks, a long sleeved top, hoodie, hat and scarf... wrapped up in my sleeping bag, and I plan on doing the same again this year. For the rest of your clothes, although sandals may go best with your outfit, I really wouldn't recommend them what with the amount of crap that gets thrown on the floor, plus the inevitable chance of mud, I just wouldn't take the risk. Wellies (or closed toe shoes, at least), are a necessity, and don't forget some comfy socks too. Because the weather is so unpredictable you really need to plan for every eventuality. I've seen loads of waterproof ponchos in the shops, you may want to get one of those - you may want to get one there if it does rain. My top tip would be to layer - the weather can change within minutes, so things you can whip on and off easily and aren't too heavy to carry around with you if you don't need to wear them - like shorts and a vest, with a cardigan / jumper tied round your waist or tied onto your bag. If you happen to forget something, or need something different or more than what you've got, there are lots of shops on site selling stuff, although we found that generally you pay a slightly higher price than you would normally. This year, Very are running a service, where if campers order anything from their phones on the Friday, it will be delivered to the Very stall onsite by the Saturday. They have a capsule collection of a select amount of items which will be available for delivery within the hour - you can read more about that here. As far as bags go - you want something across the body which does up securely, leaving your hands free. Nothing too big but nothing so small you'll get nothing in. Empty your purse before you come - bring some cash but not too much. There are cash points on site but bear in mind you'll have to join the queue of other people wanting cash too. And whatever you do, don't bring no cash, then drop your bank card in field containing a sea of people in the pitch black like my friend did last year. There are loads of food stalls all over the site. We pitched up near to the food stalls in our campsite which offered all different kinds of thing for the day time - some sold jacket potatoes, others curry, chinese, fish and chips, burgers - all very basic, but the food is there. In the morning they become breakfast bars, selling bacon and sausage rolls - the queues are immense but worth the wait. The rest of the food, I found, was a bit rubbish. None of it appealed to me - it was all greasy rubbish. I tried the fish and chips but couldn't eat it, I ended up throwing it away. 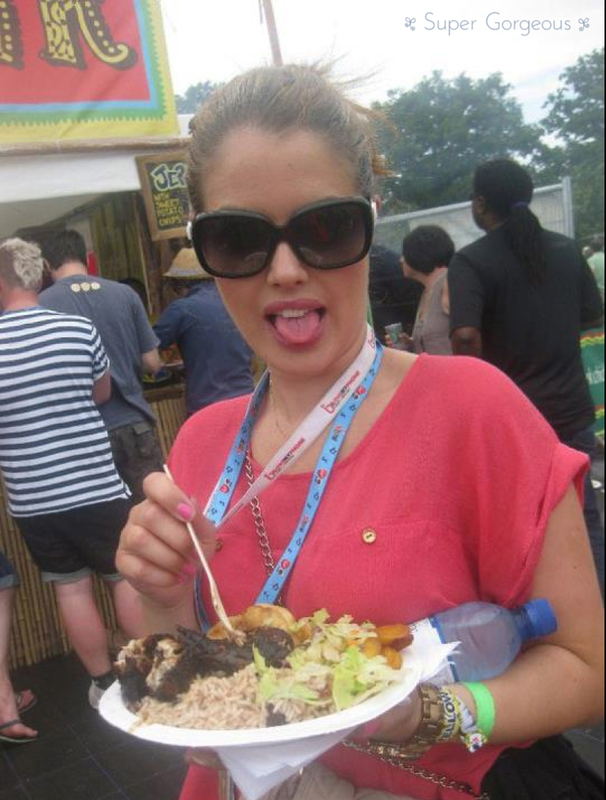 Then I discovered the Caribbean stall and that's where I ended up getting the rest of my meals from. Jerk chicken, rice & peas, coleslaw, plantain and dumpling... yes please! Ahh I can't wait! Other than the food and clothes stalls within the stage areas, there are big stations to charge your phone at. There are about 50 chargers attached to them... you'll have to queue, hold the charger into your phone at a funny angle to get it to work (particularly if you have an iPhone), then wait for ever for it to get a little bit of charge. There is also a stall where you can pay to leave your phone in a locker for a couple of hours so it can get a decent, back to 100% charge. This year I bought a back up battery from eBay for a mere £3.85 from this seller which arrived the next day. Actually, I bought two because I remember how painful standing at the charging station was. There's also a funfair which is on constantly, a few bars, portaloos, and masseurs which come out at night... you have to pay, but after a dodgy sleep sometimes it's the only thing to do the trick! Last year, the yellow campsite had 'luxury toilets' - I think we paid £7.50 for a wristband which entitled us to use them all weekend - they were still chemical toilets, but far far far nicer than the portaloos around the festival - they had hot running water, soap and hand cream... they even had a mirror and framed pictures! It was the best £7.50 I spent that weekend and I hope and pray they have them there again this year. 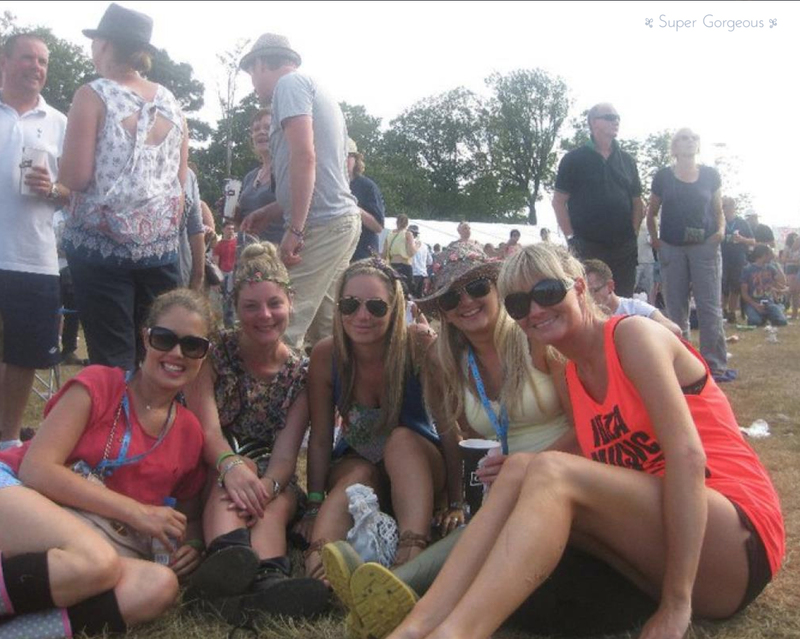 Red campers, fingers crossed - they didn't have them last year, but you never know! Bring a roll of toilet paper, and hand sanitiser (Cuticura have recently bought one out which is a sanitising serum, it's really nice because your hands don't feel dry after aaaand it protects for up to 8 hours) for when you have to use the portaloo - as well as keeping your hands clean, remember a lot of people who wouldn't bother will have touched the doors etc, yuck. Just be as clean as you can - and take some Immodium with you just in case you do get a bug. I can imagine the last place you'd want to be is there, having to queue for the toilets, then when you get in there it's the skankiest toilet you've ever seen. Better to be safe than sorry. This is meant to be a beauty blog, and I've left it so long to talk about anything beauty related - pardon me! I'm sure you are well aware that there are no showers in the non-VIP camping. You can buy solar showers - the tent next to us had one last year, but I wouldn't fancy doing it in public, and it looked a very slow and painful process. Instead, we cleaned with wet wipes. Yum! We used face wipes for our faces, and Simple eye make up remover wipes, although now I know there's hot running water in the luxury loos, I will probably take a small cleanser with me. Now is the time that your beauty box goodies will come to good use! Any little bottles of stuff are fab - don't bring anything too big or bulky. Boots have 3 for 2 on travel toiletries at the moment. Dry shampoo is another must. 3 days without washing my hair will be a horrible sight, so that will help it somewhat. Body spray is really nice to spray all over you to make you feel like you've had a shower, and don't forget your toothpaste! If you want a bit of luxury, I like Optrex's Eyedew sparkling eye drops - they wake my eyes up even when I don't feel awake, and they don't take up hardly any room in a wash bag. Ibuprofen, sun protection and plasters are other wash bag essentials. Make up wise, don't take anything too expensive. You'll be leaving stuff unattended in the campsite. I'd like to think no one would go snooping to see if anyone has anything worth stealing, but it may just happen. MUA is ideal - a palette for £4... it doesn't matter quite so much if that goes walkabouts. Again, only take what you need - if you have products which do two jobs, like a lip and cheek stain, take that, save some space! If you got the Benefit freebie in Glamour mag a couple of months ago, now's the time to use it! You want your make up to last for a very long time, so anyone who got the Porefessional Primer, it's an ideal time to use it. Generally, on the Friday, people are just pitching their tents and chilling out. We took a disposable barbeque and had a few drinks, it was really nice. Get yourself a lanyard (I think they're about £8-10) telling you who's on what stage when. I had a pen with me and marked all the people I wanted to see so I didn't get lost in the moment and forget anyone important. Most of all, have fun! We'll be aiming to pitch up somewhere near the luxury toilets and food stalls - if you see me, say hi! And a final word of warning - if you see a plastic cup filled with liquid coming towards you, get out the way - it's probably wee!